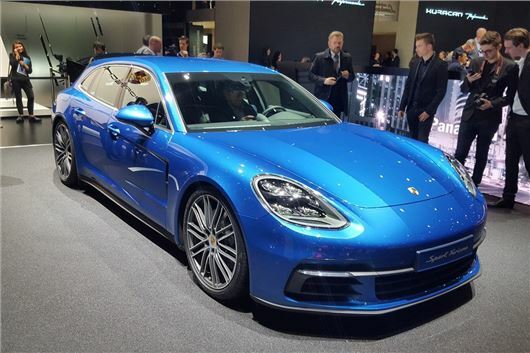 Porsche has announced a shooting brake version of the Panamera, called the Sport Turismo. It will make its debut at the 2017 Geneva Motor Show and is and is available to order now, with first deliveries expected in Autumn 2017 and a start price of £73,017. Porsche is calling the Sport Turismo a 4+1 – which essentially means it has a little, occasional-use middle seat in the back row, unlike the four-door only Panamera saloon. There’s more head room for back row passengers than the saloon, plus a usefully large 520-litre boot. The rear seats fold down individually, providing a maximum load capacity of up to 1390 litres. That’s not that much more than the 1304 litres of the regular Panamera - but the Sport Turismo’s taller roofline and power tailgate (which has an active spoiler on top) should make the load space more useable. The engine range mirrors that of the saloon, with 330PS, 440PS and 550PS petrol engines, a 422PS diesel and a 462PS petrol-hybrid. The hybrid has slightly less load space then the other models because of the battery pack, but it should provide affordable running costs. Performance figures are said to match those of the saloon – so the 550PS petrol engine in the quickest Turbo model will get the car from 0-62mph in 3.8 seconds and on to a top speed of 190mph. All versions come with all-wheel drive as standard.